It has taken five years, four judges and three rounds in a lawsuit to decide a doping scandal between a state horse pulling association and one of its members. And it’s still not over. There soon might be a fourth round in court. Many thought it was over after the most recent case when a three-judge Michigan Court of Appeals panel ruled in favor of a Chippewa County man accused of breaking competition rules. The case started in 2012 when a horse owned by David Esslin of Goetzville, Michigan, then a member of the Bear Lake-based Michigan Horse Pulling Association, tested positive for an illegal substance. He was fined and suspended from the association. Esslin fought the drugging allegations by suing the association, successfully, for thousands of dollars. The association banned Esslin after the lawsuit. Esslin wanted back in, so he took the group to court where a Clare County Circuit Court judge ordered his reinstatement. The group appealed the reinstatement but lost that battle as well, according to court documents. Esslin, 62, said he took the drugging allegations personally. As a result of the court battles, he may now again become a member of the association that fought for years to shun him. Maybe, depending on the outcome of yet another round in the litigation. Esslin’s attorney, Michael Gorte of Bay City, Michigan, said the association has defied the appellate court ruling to reinstate Esslin. If Esslin isn’t a confirmed member soon, Gorte said he plans to file a motion to force the association to accept him back and to seek damages and attorney fees. “We won at every level, yet they continue to protect him from competing,” Gorte said. “He hasn’t been able to in the last three years. “He used to compete against the association’s leadership and would trounce them. They were obviously jealous,” he added. Meantime, Esslin said the association notified him at a recent meeting that he is reinstated but “has not cashed” any of the last two membership fees Esslin turned in. Horse pulling is a competition usually found at county fairs, Esslin said. 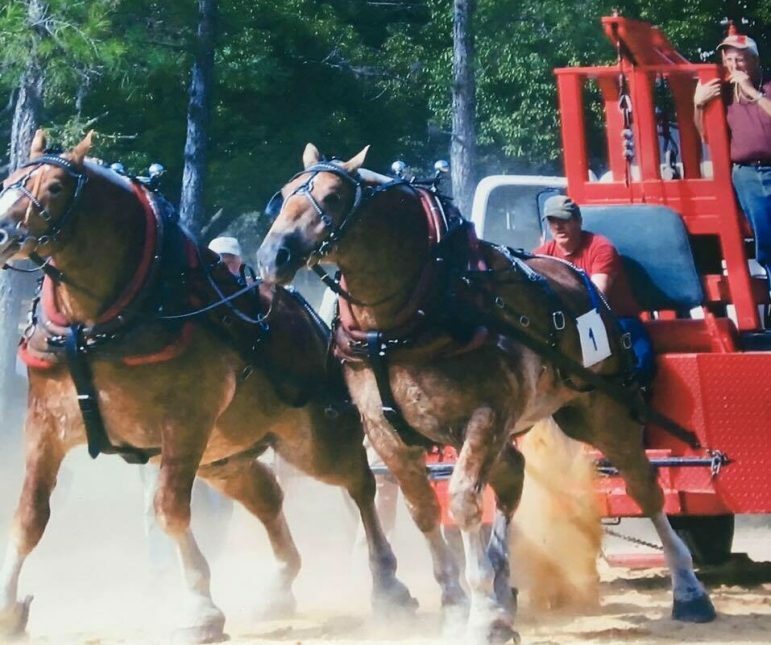 A two-horse team is trained to pull cement slabs nearly 30 feet. Pullers have three chances or they are eliminated. If the horses make it, the process starts over but with more weight. This repeats until the horses don’t want to pull anymore. Whatever team pulls the most weight wins. Gorte said Esslin was getting offers of up to $100,000 for the horse teams he had trained before the scandal started. So it wasn’t just a hobby put into limbo when his horses were required to produce a urine sample in 2012, Esslin said. The Michigan Department of Agriculture and Rural Development’s Livestock Animal Drug Testing Service found polyethylene glycol in the urine. The drug is legal, but it is often used to cover up other drugs, said Gina DeWitt, the manager of the testing service. There must be three positive tests for DeWitt’s office to confirm a drug’s presence in urine, and polyethylene glycol was masking a second drug just enough to muddle the tests, she said. Two other tests discovered dexamethasone, a steroid that is illegal in horse pulling. She told the association she suspected dexamethasone but couldn’t confirm it. The association requested the sample to be tested again at a different lab in Iowa, she said. The Iowa lab confirmed dexamethasone. The association fined Esslin $1,970 and suspended him for 30 days, according to court records. Esslin sued the association for libel, saying the club shouldn’t have gone further than the Michigan test results. To avoid a lengthy, expensive trial, the association’s insurance company settled with Esslin for $7,500. Esslin served his suspension and paid the fine with the insurance settlement money, he said. But when he tried to rejoin, he was rebuffed, according to court documents. His suit claimed there was an agreement in the settlement that he would be let back in if he paid his fines. But Todd said Esslin was an insurance liability, and the association couldn’t afford more court fees and higher insurance premiums. Clare County Judge Thomas Evans ordered Esslin’s immediate reinstatement. Based on the club’s bylaws, if Esslin paid the fines and served the suspension, then he was entitled to membership, according to court documents. The recent Court of Appeals ruling confirmed Evan’s original decision. If there is one negative ramification of the prolonged dispute, it would be that horse pulling doesn’t need bad publicity, Esslin said. Interest in the sport is dwindling and the association already has enough heartache.